I am convinced that in times such as these, every man must be a soldier, in substance as well as in name. 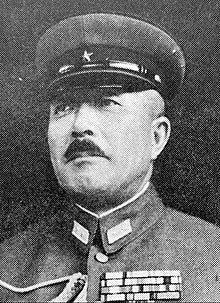 Seishirō Itagaki (January 21, 1885 – December 23, 1948) was general in the Imperial Japanese Army in World War II and a War Minister. He surrendered Japanese forces in Southeast Asia to British General Louis Montbatten in Singapore on 12 September 1945. After the war, he was taken into custody by the SCAP authorities and charged with war crimes, specifically in connection with the Japanese seizure of Manchuria, his escalation of the war against the Allies during his term as War Minister, and for allowing inhumane treatment of prisoners of war during his term as commander of Japanese forces in Southeast Asia. He was found guilty and condemned to death in 1948 by the International Military Tribunal for the Far East. Itagaki was hanged on December 21, 1948 at Sugamo Prison, Tokyo. Now that the Emperor has accepted the Potsdam Declaration, we must lay down our arms. Obeying the Emperor's order, we shall not fight. We must keep peace and order and we shall not make any trouble. Quoted in "Red Star Over Malaya" - Page 130 - by Boon Kheng Cheah - History - 2003. Quoted in "The Fight for the Pacific" - Page 157 - by Mark Gayn - 1941. Quoted in "Pacific Affairs: An International Review of Asia and the Pacific" - Page 1 - by University of British Columbia - Pan-Pacific relations. It is a place rich in natural resources, having everything we need for national defense, a crucial place for the empire's self-reliance. The place is crucial too for our wars with China, Russia, and the U.S.
About sending troops to China's northeast. March 1931, from speech entitled "Manchuria and Mongolia from the Military Point of View". Quoted in "China in the World Anti-Fascist War" by Peng Xunhou - Page 23 - 2005. We hope the peace will last for twenty years. Then we will be here again. To the Sultan of Johore. Quoted in "Key to Japan" - Page 289 - by Willard Price - 1946. Quoted in "Time" - by Briton Hadden, Henry Robinson Luce - Australia - 1923 - Page 29. The Chinese courts have tried many Japanese officers for their crimes against the Chinese. These men committed thousands of crimes against Koreans. They killed and persecuted thousands of our people for refusing to help the Japanese war effort. They forced Koreans into the coal mines as slave laborers and let them die of tuberculosis and neglect. I am convinced of the necessity to take an effective measure of self defense. Quoted in "Oakland Tribune (Newspaper)" - February 21, 1939, Oakland, California.